The ticket for 3D movie is still expensive, then how to watch 3D movies as you wish? MediAvatar 3D Converter is the answer. With outstanding 2D&3D converting capability, it enables you to watch the breathtaking 3D movies at home by converting videos from 2D to 3D, even 3D to 2D, as well as converting one kind of 3D format to another. All the popular video formats like M4V, VOB, ASF, 3GP, 3G2, SWF, H.261, H.264, DV, DIF, MJPG and MJPEG are supported. Besides, it works well with multimedia devices, such as iPhone, iPad, Apple TV, iPod, PSP, Xbox, General mobile phone, BlackBerry, General MP4 players, Android mobile devices and Windows Mobile devices. General mobile phone, BlackBerry, etc. Android mobile devices: Nexus S, HTC Desire HD, HTC G2 Magic, HTC Tattoo, Motorola Droid 2, Motorola CLIQ, SamSung P1000, etc. Convert 3D movies from most 2D video formats including MP4, FLV, MKV, H.264/MPEG-4, DivX, XviD, MOV, RM, RMVB, M4V. It also supports to convert kinds of 3D videos to normal 2D videos. You can convert formats between 3D videos like Side by Side, Side by Side (half-width), Top and Bottom, Top and Bottom (half-height) and Red/Cyan Anaglyph freely as you need. Watch 3D movies on your standard TV with outputting Red/Cyan Anaglyph 3D video format supported. Change settings and other parameters such as video quality, video codec, channel, bit rate, frame rate, etc to meet specific needs. 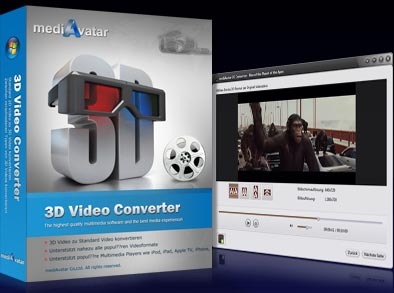 Play different format files with MediAvatar 3D Converter’s built-in media player. MediAvatar 3D Converter’s interfaces are available with English, French, German, Japanese, Spanish, Italian, Portuguese, Simplified and Traditional Chinese.